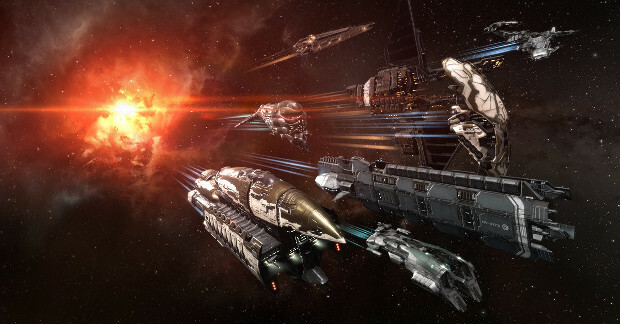 Since the release of EVE Online’s Alpha and Omega clone system — which allows players to join the game in a somewhat limited capacity for free — the game has seen quite a few players jump in and try things out. Unfortunately, as noted by CCP Games at the EVE Vegas event, players weren’t sticking with it. They either became frustrated and quit or just opted to subscribe in order to get access to everything. While that latter option might be a bonus for CCP financially, it wasn’t exactly what they were going for. In order to address these issues, the company announced plans to expand on the features available to Alpha Clones. Part of the plan is to expand the skill set available to Alpha Clones, granting them free access to all Tech I hulls up to the Battleship class. Cross-faction training is also being made available — a huge plus, and players will receive free access to skills required for the use of Tech II weapon systems. The bulk of these changes are covered in a post on Clone States on the EVE Online site. Previously announced as part of the Lifeblood expansion, the expanded Alpha skillset is now dropping with the Arms Race update on December 5th alongside an event catering to Alpha Clones, the Arms Race Event. Also included in the update is a new training option for Alpha Clones that allows players to gain skill points on a daily basis. Details on all of these things — as well as a slew of other content being added with the update — can be found on the EVE Online site. you see its like what most of the vet players stated they wanted the free to play players be the seal cubs that the big boys can bash around. That is the only reason they want those players and the very reason they didn’t really care to have new subs. They want players that can’t progress and just remain punching bags for the upper class. is that few frustrated players left alpha game show future game play – less than 10000 players online that pointing to shutdown in next year ?!!! money,money,money,….shuting,..shuting,..shuting,… i hope they shut down for their greed, to bad they have good game , leading by id….s.